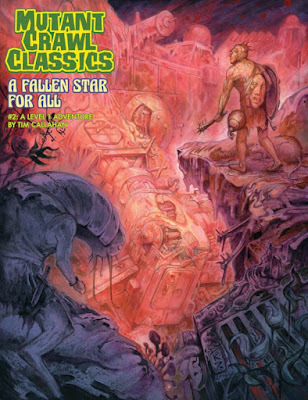 Mutant Crawl Classics #2: A Fallen Star for all is the second release for Mutant Crawl Classics Roleplaying Game – Triumph & Technology Won by Mutants & Magic, the spirutual successor to Gamma World published by Goodman Games. It is the first adventure to be designed for use with player characters who are not Zero Level, being instead designed for player characters of First Level. What this means is that it is not a Character Funnel, one of the features of both the Mutant Crawl Classics Roleplaying Game–and the Dungeon Crawl Classics Role Playing Game it is mechanically based upon–in which initially, a player is expected to roll up three or four Level Zero characters and have them play through a generally nasty, deadly adventure, which surviving will prove a challenge. Those that do survive receive enough Experience Points to advance to First Level and gain all of the advantages of their Class. In terms of the setting, known as Terra A.D., or ‘Terra After Disaster’, this is a ‘Rite of Passage’ and in Mutants, Manimals, and Plantients, the stress of it will trigger ‘Metagenesis’, their DNA expressing itself and their mutations blossoming forth. So as A Fallen Star for all begins, each of the player characters will likely have their mutant powers, their Class abilities, and some equipment scavenged from their previous adventures. Originally released as a Stretch Goal for the Kickstarter campaign for the Mutant Crawl Classics Roleplaying Game, the scenario does share something in common with ‘Assault on the Sky-High Tower’ in that the player characters are directed by their tribe to go out and scavenge an Ancients site for the artefacts that might still remain despite the effects of the apocalyptic event that destroyed the Ancients' world and society. This though, should be no surprise, since the player characters, having completed their Rite of Passage have been designated the tribe’s ‘Seekers’, those who go to find the technology of the Ancients which would both protect and make the life of the tribe better. As A Fallen Star for all begins, scouts have returned to the village with reports of a meteor strike to the north in the taboo crater country. The strike has opened up a huge chasm within which stands what could be the largely intact city of the Ancient Ones. If so, there will be more than one tribe or group interested in combing the site for old tech, so the player characters–the Seekers–need to get a move on. After a short introductory scene, the scenario proper begins with the Seekers approaching the crater site. The scenario consists of two areas, the first a wilderness around the crater and the second the crater itself and the complex below the crater. The wilderness area consists of just five locations or encounters that the Seekers should run into on their way to the crater. These are all pleasingly straightforward and simple encounters that reflect the damage that the meteor did in the wake of it crashing to Earth. There is room here too for the Game Master to add encounters of her own, especially if the player characters have rivals or their tribe has a rival tribe. There is room here too for encounters with members of rival or even similar Archaic Alignment, the semi-secret organisations with common belief systems, interests, and goals found in the world of Terra A.D. This is because they too would have an interest in what might be found in the crater. The encounters with rival groups continue once the Seekers enter the complex, a mix of room and wandering encounters. Yet where the number of encounters outside of the complex felt reasonable, inside they feel cramped in just the fifteen locations described in the scenario. Indeed, the complex itself feels quite small, not large enough for the plot at the heart of A Fallen Star for all that the author is trying to tell. The plot of the scenario itself–essentially children wanting revenge–feels just a little similar to the plot of ‘Assault on the Sky-High Tower’, the scenario to be found in the back of the Mutant Crawl Classics Roleplaying Game, to be run quite so soon after completing that Character Funnel. Ultimately, what the scenario really needed is the space to develop the plot and perhaps expand the size of the complex, as after all, the Seekers are expecting to discover a whole ancient city. It is though, something for the Game Master to think about in preparing to run A Fallen Star for all. Although there is not a great deal to be found in terms of loot to be taken away, the scenario presents plenty of opportunity for the players to make Artefact Checks for their characters and so work what the complex is and how it works. There are also quite a few NPCs for them to interact with rather than just fighting them, giving both them and the Game Master opportunities to roleplay. In particular, the Game Master has one NPC that she should really ‘nanny’ up–whether that is a la the films Mrs Doubtfire or Mary Poppins is up to the Game Master to decide–to get the most out of. Indeed, she should be the most memorable of all of the NPCs to be encountered in A Fallen Star for all. Ultimately, the biggest issue with the scenario is that it explains the plot as it goes along. As with any scenario there is the plot that the players and their characters are aware of at the begining and then there is actually what going on–the true plot. A Fallen Star for all never gives the latter as a whole, but rather in a piecemeal fashion as the Game Master is expected to learn it at the same time as her players and their characters. It is a very frustrating way of learning said plot because it makes it all the more difficult for the Game Master to prepare the adventure. An experienced Game Master should not struggle with this, but an inexperienced Game Master may well do so. Physically, A Fallen Star for all is nicely presented. The artwork is mostly good and does a decent job of imparting the weirdness of Terra A.D. The map of the complex is a little awkward to grasp in places, but a careful read through of the text should help the Game Master prevent that from becoming a problem. As with Mutant Crawl Classics #1: Hive of the Overmind before it, A Fallen Star for all is a short adventure, running to just twenty pages in length. This should provide a playing group with two or three sessions worth of gaming, but A Fallen Star for all does feel as if it should have been longer, with a better explanation of what is going on and of what the plot is as well as room to develop the complex and perhaps plant more clues as to what the nature of the plot is. Perhaps it is because the plot is not explained as well as it should be that Mutant Crawl Classics #2: A Fallen Star for all feels underwhelming. Despite this, the scenario includes some decent enounters and opportunities for some fun roleplaying and in the hands of a good Game Master, Mutant Crawl Classics #2: A Fallen Star for all should provide a decent adventure.